Results: third & first with Alvin Ailey. The yellow is new. The only other yellow ribbons in my saddleseat collection (so far) are part of the championship ribbons (puff, puff). That makes at least one blue from every saddleseat show except the Horsemanship Challenge (she says, tempting fate….). When I arrived, I found that Adult Academy Walk-Trot had six riders. 6!! I had been getting far too blase from classes with two entries. My second from the previous show may have been last place, but it was still a red. In the last few lessons with Alvin, I had skipped my standard pre-ride panic attack. So, the nerves on Saturday where straight-up show nerves. I don’t care what it is. If I compete, I want to win. There is a good reason Hubby refuses to play cards with me. I am slowly working my way through Nerve: Poise Under Pressure. 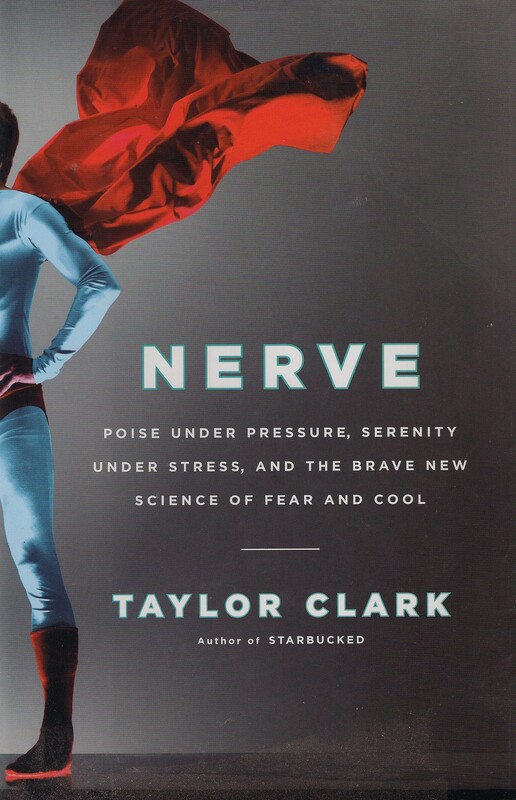 Serenity Under Stress, and the Brave New Science of Fear and Cool by Taylor Clark [Little, Brown 2011]. I reminded myself that neither first place nor last is a referendum on who I am as a person. It helped. Not completely, but somewhat. I considered that any placing had advantages. A win would be lovely. A last place would point out areas I needed to work on. Again, partial success. Finally, during the class before mine, I watched Alvin go with one of the juniors (They won). The thought slipped into my head, Hurry up, I wanna get on & ride. Slowly, I make progress. Alvin was his stellar self. I rode fine. I heard “Sit back” from the rail a few times. Situation normal. We came in third. Apparently, I would sit back on command but only briefly. Within a few steps, I would lean forward and get on with whatever mysterious business keeps me so occupied in the show ring. I would have said I rode exactly the same as I did at home. Apparently, no. In between classes, I asked Assistant Instructor for advice. I had no doubt that Head Instructor was correct. I thought hearing the problem phrased differently might help the message sink through my cranium. When I asked her what body part I was moving, she said, “All of them.” Her buzzword was ‘Still’. This is a lifelong challenge for me. 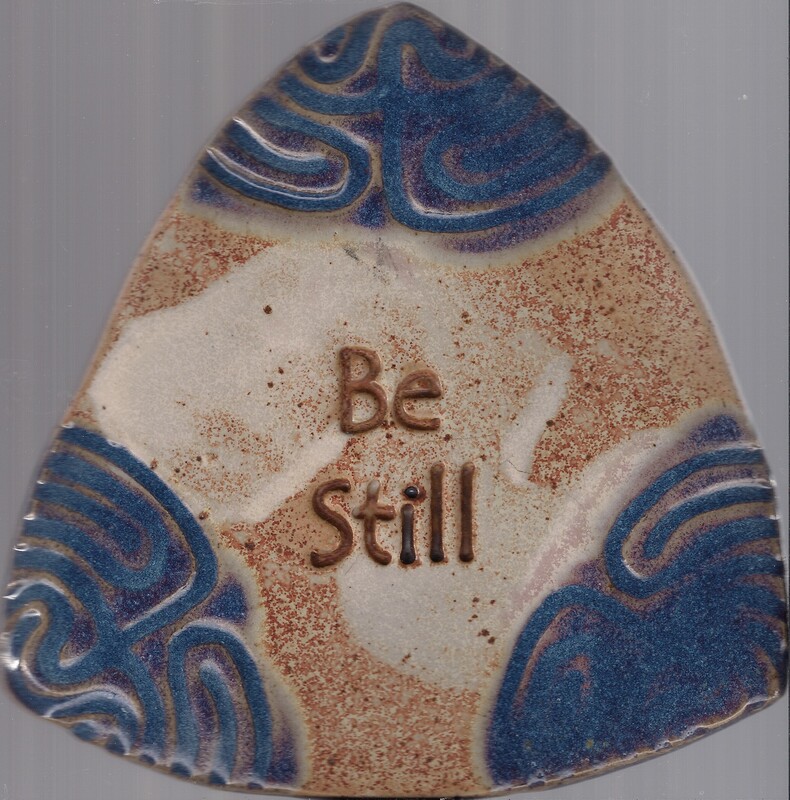 Hence the inspirational wall decoration from Wortman Pottery. I was determined to be still. If I was going to get yelled at, it would be for doing too little. I achieved the riding equivalent of sitting zazen while thinking about my breath. Do you have any idea how HARD it is for me to remain quiet even for the duration of a walk-trot class? I was so focused on holding myself neutral relative to the horse that I did not have the brain space left to organize a smile. We won. Afterwards, folks congratulated me. I agreed with them. No polite demurrals here. I’m proud of that blue. It may be from a little fun show, but I worked my @$$ off for it. Good news for the helmet evangelists among us. A rider in the five-gaited class wore a helmet. Emma – yes. Leg position & use: okay to good. Posture excellent. Needs to sit back … where have I heard that? I want her hands. All that really matters is if her heart is in it. The rest is details.